The Moor. Just the thought of it can bring up feelings of bleakness, isolation and forbidding places. An Britain has it's fair share of moorland too, from the windswept southern moors in Cornwall and Devon to the harsh and uncompromising northern moors of Yorkshire and Lancashire.And yet these places have supported industries and livelihoods for hundreds of years and inspired some of most well known literature as well as providing perfect environment for some of the unique flora and fauna perfectly adapted to these places.In this book, Atkins walks these moors to uncover their past events and the people that inhabited them, as well as absorb their stark beauty. He visits Dartmoor prison in the centre of Dartmoor, which presents any prisoner intending on escaping with the toughest of journeys. He joins shoots on the moors, and visits those that still have legends that haunt the location.Well worth reading, Atkins has given us a fascinating account of some of the the harshest environments that this country has, and has brought the history of them alive. 3.5 stars overall. 3.5On a clear day, if I look out of my house's upstairs windows I can see the outline of the North Yorks Moors hills in the distance, about 15 miles away.On nice days we might choose to go walking across their network of footpaths and bridleways, admiring the lambs in the Spring and the purple heather in the autumn.Between November and February I don't tend to go anywhere near them! Seeing pictures of banks of snow and impassable roads on the local news is quite enough. Until I read this book I knew very little about the moors, not just in North Yorkshire where I live but the other moorland areas of England. I liked the mixture of natural history, social history and the role of the moor in novels and poetry. And it's given me a good view of what the moors are like during the months that I avoid them. I have the luxury to be able to do so. Farmers, gamekeepers, wardens etc have to deal with them every day of the year.Atkins writes well, although I felt that some chapters (the grouse shooting for instance) went on far too long. And why no illustrations of such a scenic area? Not one photograph or any sort of picture in the entire book. As someone who has been walking moors since I was a toddler (and I am now well on the way to the opposite end of life) a book on moorland was a must read. I can happily say that I enjoyed this book ranging widely over subject matter and areas. I've walked on all the areas mentioned over the years and for some areas I've visited rarely I learnt quite a bit; much less so with areas I'm fairly well acquainted with. The main problem I have with it is while I love rambling over moorland so does this book. The choice of subject matter for each moorland area is very personal and at times obviously important - the Abbot's Way on Dartmoor, Jamaica Inn on Bodmin Moor and Ian Brady on Saddleworth Moor are examples. However there were times when I felt that the original subject had become lost in a diversion only to suddenly reappear unexpectedly. The space given over tor some of the moorland areas is rather limited and I felt a little frustrated at times that there was insufficient about a subject I'd become interested in and more than I wanted on another subject.Any lover of moorland will be very happy to have this on thier bookshelves even if it is rather idiosyncratic in its approach. Covering industrial use, flora and fauna, social history, the environment, literature to name but a few of the subjects mainly for nine moorlands in England is bound to be a challenge but I would recommend it to those with an interest in the wonderful environment we know as "moorland".Disclosure: I received a review copy of this book from the publisher. The right kind of nature writing; Atkins doesn't just wax lyrical about nature, but explores the effects that humans have on "wild" environments, in this case English moors from south-west to north-east. He may go a bit overboard on description at times, but it's full of interest. I particularly like the way he finds an individual historical character, such as a farmer, and uses documentary evidence such as journals and account books to bring a period to life. One strong theme is grouse-shooting, not surprisingly. He does a good job of exploring the issue from both sides, spending time with shooters, gamekeepers, and their opponents -- without going so far as to defend the indefensible (the elimination of hen harriers for example). I enjoyed this book. It is non-fiction which I don't read often so it was a refreshing change for me. The author travels around England to various moorlands interviewing characters he meets, exploring and laying out the history of the area. The book is sprinkled liberally with allusions to literary figures such as Ted Hughes, Emily Bronte and WH Auden with interesting stories I hadn't heard before. I particularly enjoyed the section on the North York Moors as I knew this area well as a child. He describes a grouse shoot in all its barbarity and delves into the differing local views on the subject. In the past the moors were often referred to as a dead space like a desert but I must say I have never found them so. They are full of life: hawks, heather, cotton grass, sphagnum moss... I have always felt drawn to them. As a child you could ride across them for hours hardly seeing a soul save a tweed clad farmer who would tell you your riding lessons were too expensive and use thee and tha to address you like an Elizabethan poet. It made me feel very nostalgic for the Yorkshire moorlands even in the viciousness of their winters which are well described by Atkins. There is something glorious and other worldly about them. You can find God there. 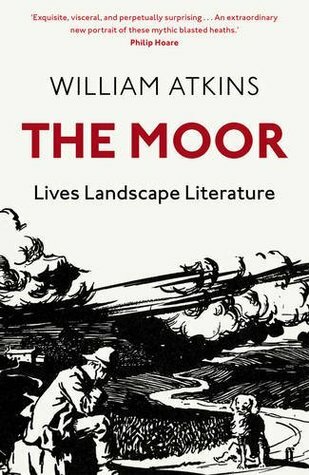 Atkins explores the grim English moors on various levels:The Mooris a mixture of natural and social history and it also examines the role of moors in literature (Wuthering Heights! Jamaica Inn! The Brontës! Ted Hughes!). It's a landscape of grouse shooters, mine relics and military fields. Fascinating read, although the final chapters are a bit tedious. Don't be discouraged by the many geographical references, the book is a pleasant enough read even for those lacking geographical background information. My edition has as its title: The Moor: A Journey into the English Wilderness. Not sure why because the original is more accurate and inviting. We are in the English wilderness, but we have companions. Great ones: Brontes, Auden, Hughes; the lesser known historical writers and workers( whose names I kept googling!) and the folk who inhabit the moors today. Atkins is a romantic to me - his prose is beautiful with a kind of longing. I will be paying attention to the Wainwright Prize selections in the future. A few maps and pictures should have been included. Very interesting and serving to realise how much of my A level geography I don't really remember. Moors, like for me the architectural arch, amaze and intrigue me and this was comprehensive enough to give a tour and a taste - and more - about their complex ecosystems and associated culture. Thorough, pleasant but somewhat exhaustive. This book has something of the feel of a "first" book. Atkins is clearly a talented writer and has a good observational eye but like the moorland he describes, the book feels patchy as though there are some connections missing.Perhaps part of the problem is that few of us will be familiar with all the moors that he describes. I can see the South Pennine Moors from my house, and have holidayed a fair bit in the North York moors, but know Bodmin moor not at all and hadn't even heard of Otterburn Moor. It therefore becomes difficult to picture what he is describing without just falling into a generic moor description (grouse, grouse, eccentric clergy, more grouse).Pictures might have helped a little - though there are probably only so many pictures of sphagnum moss that a book can cope with. Maps should have been an absolute must and I am really surprised that no-one made the decision to preface each chapter with a map of the moor being described. It would, I think, have made a great difference. An interesting book and well written book, which held my interest even though it was not something I would have picked up unprompted. I enjoyed particularly the information about the various writers who have been inspired by the moors, but there was a wealth of interesting information on all sorts of diverse topics. I'm glad I read it, but am now glad I have finished it and can read a novel next. I found this book at the Fairmont in St. Andrew, Scotland library and thought I would read the first chapter since it was about the Bodmin Moors that we visited a few years ago in Cornwall with my parents. Maybe someday I will finish the book. It was a mix of information and legends about the moors. Maybe the last English wilderness, seen through the eyes of the exploring author plus other literary and historical figures. An interesting read, and in parts lovely and poetic. Would have loved some maps or images of some sort. I've always jointly loved and been terrified of the moors, this book reminds me why.